Crabs, like all harmonic patterns, feature a precise series of coiling retracements -- failures to retake the previous highs and lows. 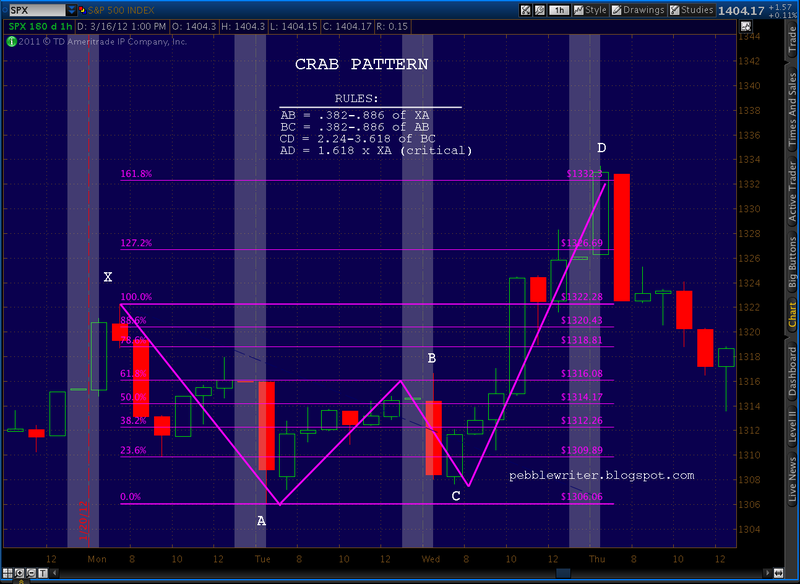 Unlike the Gartley and Bat, however, Crabs surge higher than the price level that starts the pattern before reversing, usually to 1.618X the price range previously established. 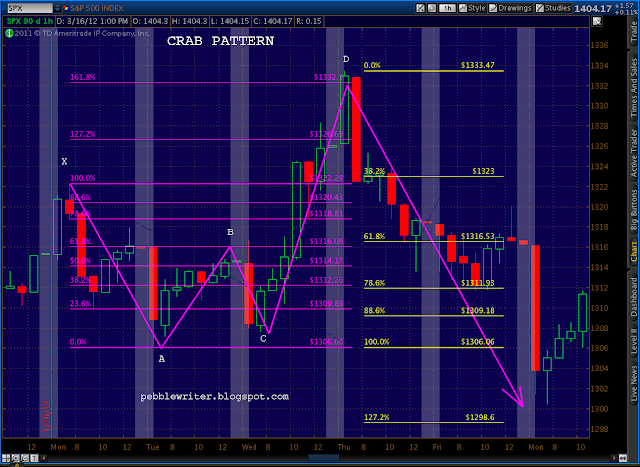 For an example of how Crab patterns work we'll look at this past January. On January 23, 2012, SPX had gained 45 points in the previous five sessions, and seemed ready for a pause. It opened strong that morning, a continuation of the overnight ramp job in the futures, but on negative divergence. After the reversal, we saw a Point C in the required range of .382 - 886 retrace of AB, and started heading higher. Point B was only slightly higher than the .618 retrace, so there was a possibility that we were working on a Gartley or Bat. Remember, a Gartley Pattern requires a reversal at the .618 and plays out to the .786. A Bat features a reversal below the .618 and completes at the .886. Given a reversal this close to the .618, many traders would attempt to play each prospective pattern as it came along. We'll save a discussion of various strategies for another post. Suffice it to say that after SPX cleared the original Point X, a reversal at the 1.618 extension was definitely in the cards. We saw a slight pause at the 1.272 -- where a Butterfly sometimes reverses -- and reached the 1.618 when we gapped open the following morning. Because the final surge was so strong, we overshot by 1.17 -- reaching 1333.47 versus our Point D target of 1332.30. 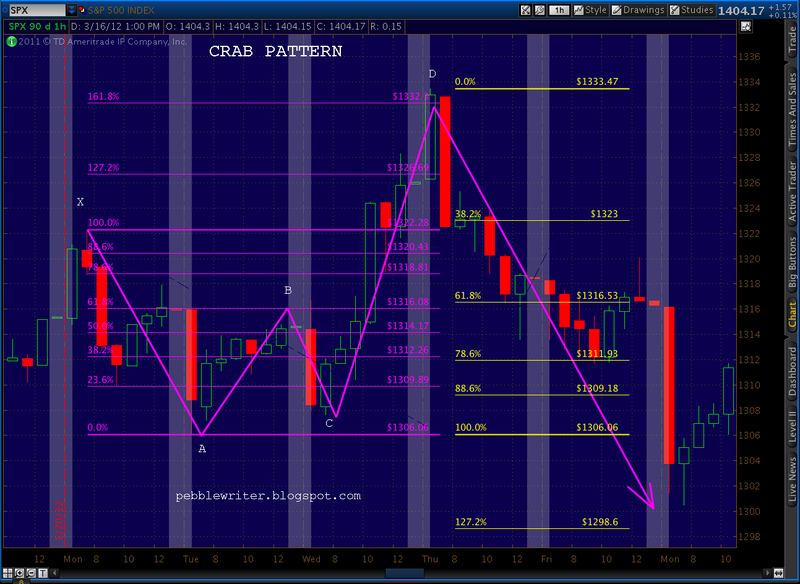 Like all Crab Patterns, the degree of the reversal is a function of many other factors. The strongest reversals are those that take prices in the same direction in which the market was already trending. But, in general, we look for a move of .618 of the AD price distance. Beyond that, we look for other Fib levels such as .786, 1.272, 1.618, etc. They're charted below in yellow. In this instance, we reached the .618 level at 1316.53 a few hours later, bounced at the .786 at 1311 and continued to 1300, very close to the 1.272 Fib level. All in all, we had a 33-point move off the 1333 high -- about 2.5%. For an active trader, a 33-point move opens up some very profitable opportunities. However, it's often difficult to forecast the degree of the move, so many traders play the reversal and get out once a modest profit is in hand. 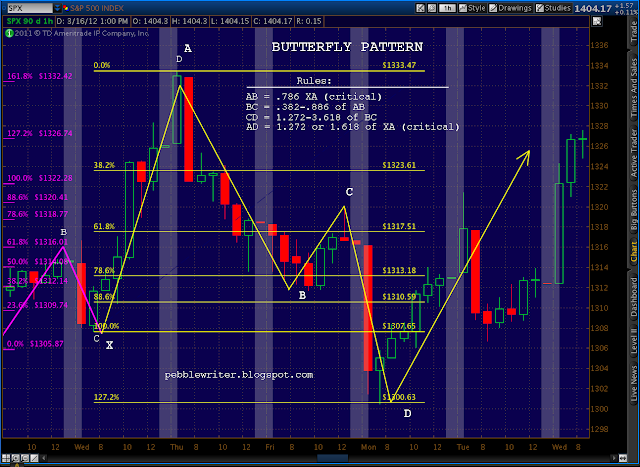 We had a little help in anticipating the degree of this reversal because once we reached and reversed at the .786 on the way down, there was a possibility that we'd go on and complete a Butterfly pattern that normally extends to the 1.272 or 1.618. In fact, that's exactly what happened. Butterfly Patterns are the fraternal twins of Crab Patterns. 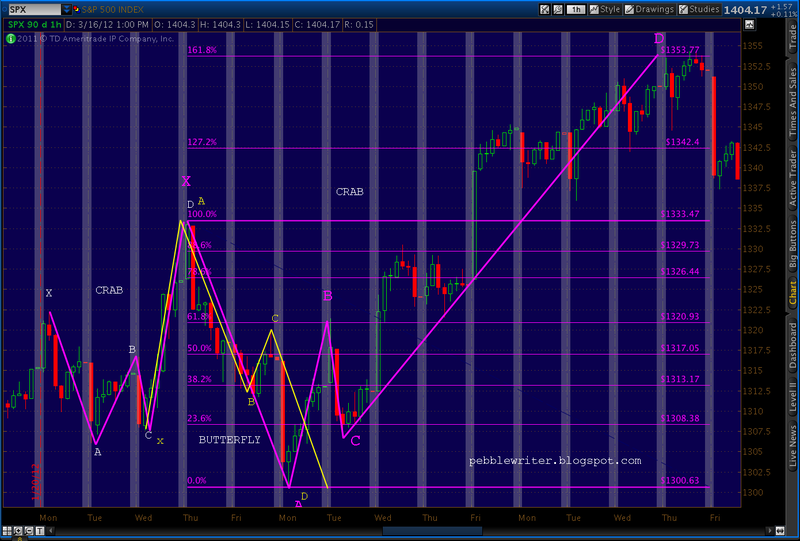 They require a Point B at the .786 XA retracement, rather than the Crab's more generous range. And, they complete at either the 1.272 or the 1.618 extension. In the example above, we saw a completion only 14 cents away from the 1.272 extension target. 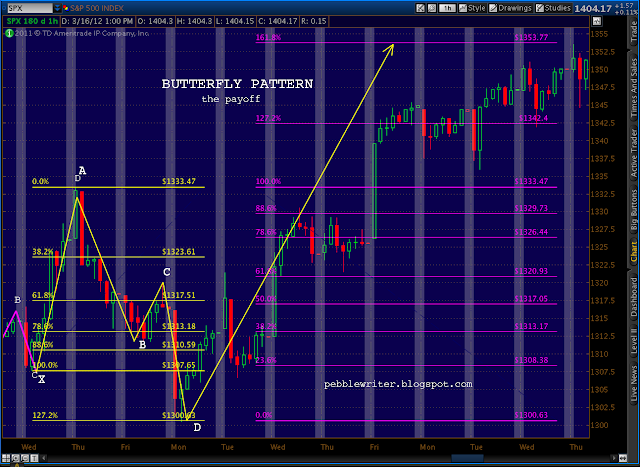 Note that the previous Crab pattern melded into a Butterfly: the Crab's Point C became the Butterfly's Point X. And, the Crab's Point D became the Butterfly's Point A. Because Butterfly Patterns can extend to the the 1.272 or the 1.618 Fib levels, they can be a little tricky. Playing the 1.272 means placing appropriate stops, just in case it's the 1.618 that shows up instead. The results are similar to other harmonic patterns -- with objectives starting at the .618 of the AD, and going up from there. Relabeling the points, it's easy to see. Yet, I'll be the first to admit that in the heat of the battle, it's sometimes tricky to keep all the various possibilities straight -- especially when dealing with smaller patterns that might or might not be part of larger patterns. 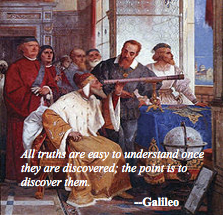 Again, I look at technical analysis, chart patterns and fractals to try to sort it all out. When the new website is up and running, I'll track as many major and minor patterns as I can on the major indices. Traders can take advantage of knowing where to look for turns, while longer-term investors can gain confidence in positioning their portfolios. Speaking of the new website, I should get back to it. But, I've had lots of questions about Crabs with all the larger patterns currently completing [see: Coming up Crabs], and wanted to get the info out asap. Good luck to all. PW, Thank you! It is amazing. A crab pattern leads to a large butterfly which leads to a even larger crab pattern. You use SPX to illustrate that. However, can we assume Dow, Comp, RUT are have these interesting behavior with a larger crab pattern right now? What do Bankers Dream Of?